Sculpt Away > Blog > Cellulite > Got Cellulite? Enough to send a shudder down your spine, right?! You’re not alone. Some experts say that nearly every woman will suffer from cellulite at some point in her lifetime. Current statistics reveal at least 80% (some studies report upwards of 95%) of women have cellulite. But what do you really know about cellulite? I mean, really know. Not just what have you heard. True or not true? Let’s examine cellulite first, then talk about some things you may have heard. We all have some fat under our skin. This fat does not lie in a single, smooth layer; it lies clumped in multiple fat ‘balls.’ Connective tissue, called ‘septae,’ form columns of fibrous bands around these balls of fat cells producing a shape much like a honey comb. These sepate (fibrous bands) connect your muscle to your skin (the honey comb of fat is in between your skin and your muscle). (3) when the fat cells absorb excess fluids and swell. There are multiple reasons why these things occur. Look for these in an upcoming article. 1. Only women suffer from Cellulite. Why: Collagen in women is vertical, which makes it easier for fat cells top push through and pucker up. Men, in contrast, have crisscrossed layers of collagen which keep their fat in place. This is ‘mostly’ true because it is possible for men to develop Cellulite. Why: Remember the 3 causes of Cellulite? Not one of them said it was due to being overweight. Thin women are just as likely to suffer from Cellulite. 3. It’s not your fault if you have Cellulite. It’s in your genes. Why: We know that Cellulite has a strong genetic component. There’s even a genetic test to determine if you carry the genetic variant that puts you at a higher risk of developing moderate to severe cellulite. But you really don’t need the test. Just ask your mom and grandmothers. 4. Compression style clothing reduces Cellulite. Why: Wearing compression style clothing may have a temporary smoothing effect but may actually cause the problem to get worse. Any garment that reduces blood flow and circulation can contribute to Cellulite. 5. You can treat Cellulite with Liposuction. Why: Liposuction removes fat by suction but it could make Cellulite appearance even worse by making the fat distribution more uneven. It’s not a Cellulite treatment. Remember the 3 causes of Cellulite! 6. You can reduce and help prevent Cellulite with the right nutrition and by adding the right supplements. Why: We can follow the Cellulite Diet but it is impossible to consume all the nutrients your body needs to fight Cellulite. You should therefore supplement with Cellulite eliminating substances: Lecithin; Essential Fatty Acids such as DHA & EPA; Anti-inflammatories such as GLA, ALA & CLA; Amino Acids; Antioxidants; B Vitamins and Vitamin A, C & E. The Sculpt Away Nutraceutical Daily Pack (designed to supplement beauty) contains each one of these powerful Cellulite Eliminating supplements. 7. Topical creams/lotions can help reduce the appearance of Cellulite. Why: There are so many products on the market. This ‘True’ is conditional because you must be selective of the active ingredients, plus topical products alone may not be effective. Seek advice from body shaping professionals. Consider Sculpt Away Cellu-Sculpt firm + repair crème, Sculpt Away Crepe Away and Sculpt Away Lipo-Sculpt Slimming Gel, all of which target the 3 causes of Cellulite. Remember – Cellulite has 3 causes. Why: PelleFirm® and SmoothShapes® are both non-invasive medical treatments that significantly improve the appearance of Cellulite. And both treatments are FDA-approved to reduce Cellulite. PelleFirm® utilizes RadioFrequency technology to break down the septal columns, reduce the fat and tighten the skin. SmoothShapes® utilizes 2 laser wavelengths plus massage to treat the 3 causes of Cellulite: stimulate collagen, break down the septal columns and reduce the fat. Both treatments are available at Sculpt Away in San Antonio. 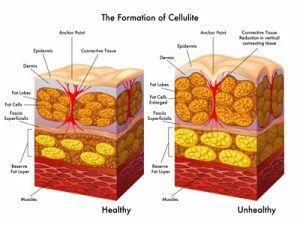 To learn which treatment is best for your Cellulite issue, contact the body shaping experts at Sculpt Away. To learn more about Cellulite, contact the body shaping experts at Sculpt Away in San Antonio at 210-227-3051 or visit www.SculptAway.com.